So as a day five tennis fashion review, we'd like to present Fila Wimbledon fashion featured by Vera Zvonareva and Kim Clijsters on women's side and Janko Tipsarevic on men's. 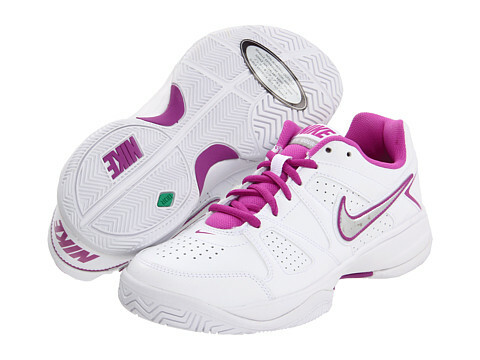 Frankly, Fila never was good in style and this Wimbledon collection wasn't an exception. Nothing special. 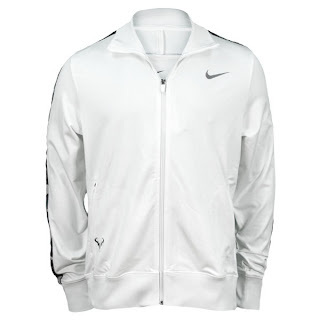 For men's and women's Wimbledon Fila fashion, check out Tennis Express, Holabird Sports or Golfsmith. Wimbledon keeps surprising. Day three of Wimbledon was last day of the tournament for many favorites including Samantha Stosur, Li Na and Caroline Wozniacki. Let's see what adidas by Stella McCartney presented for this year Wimbledon. 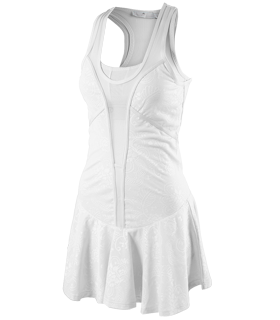 Caroline was in the same Tennis Performance dress she sported at Australian Open, but in white. 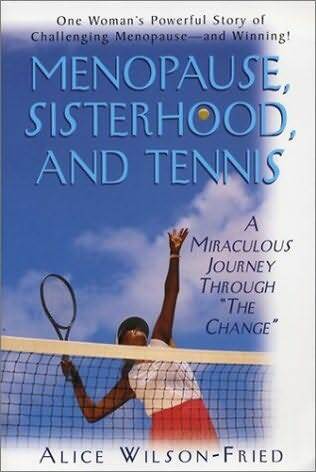 Yesterday we featured Venus Williams. Today is her sister Serena's turn. 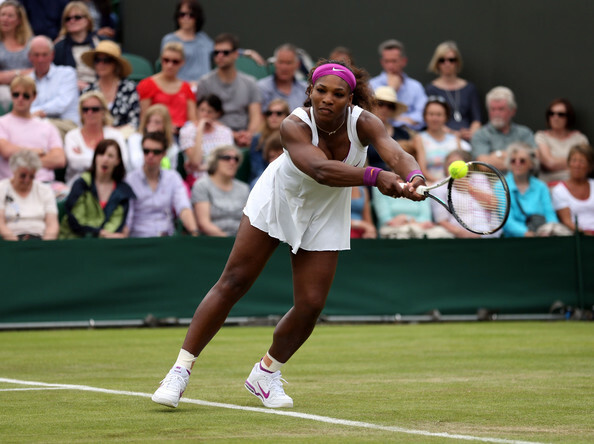 Serena finished her first Wimbledon round with a confident win over her opponent. We already featured Serena's Wimbledon dress in our Wimbledon fashion and personality quiz, and frankly on the picture it looked much better than on Serena. Either she messed up with the size, or Nike messed up with the design. This dress was too short and looked more like a nightie than like a tennis dress. However Serena did great job with accessories - choosing purple shorties and same color bandana and wristbands to brighten her Wimbledon whites. Before we all began to forget about French Open, Wimbledon started. And though traditionally white, it's still interesting to observe Wimbledon fashion, as each player tries to add something to the style and dilute white a little bit. 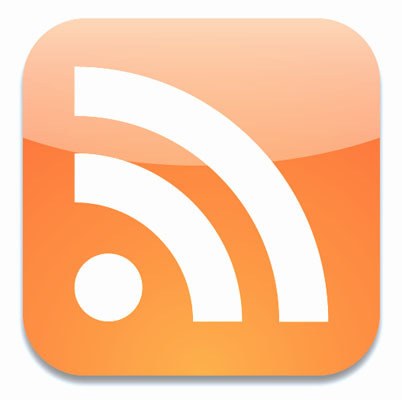 Unfortunately Venus Williams repeated her sister's Serena bad luck loosing in the first round of a major. As we already mentioned during French Open fashion review, Venus at last matured in her style and forgot about all those crazy outfits. This year's Venus' dress with transparent back (as usually, Eleven by Venus) was rather cute and had its character. The dress unfortunately is not currently sold at EleVen by Venus store, but may be it will soon. Trendy Treats for your Tennis Enthusiast! 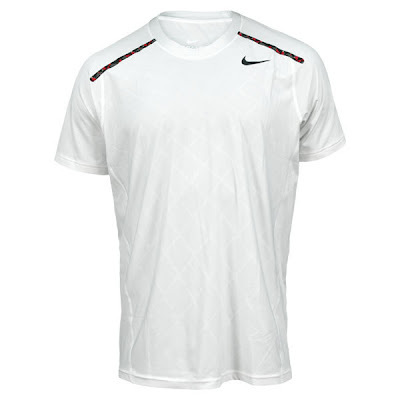 For that special guy: this cool “Evolution of Tennis” t-shirt is on sale for ONLY $22.25! It comes in a great variety of colors with sizes from small to 3XL. For the ladies: this charming t-shirt comes in a variety of sizes, from small to 2XL. 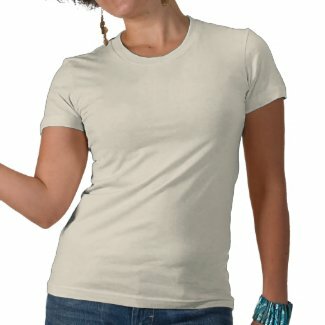 It is constructed from 100% combed, ring-spun cotton, and closely cut for a feminine fit. This hot-selling shirt retails for ONLY $28.75! 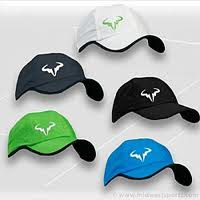 These cool and comfortable hats by Nike are a limited edition with the Rafael Nadal “bull” logo and a Nike swoosh on the bill. 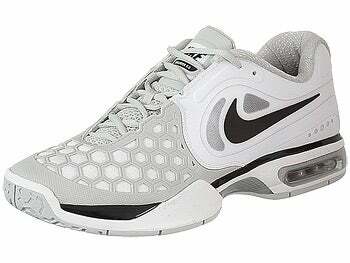 They also feature an adjustable back closure for a tailored fit. 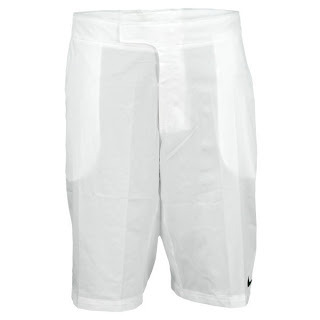 Not just stylish, they are also environmentally friendly - made from 100% recycled polyester taffeta. ON SALE NOW FOR ONLY $14! 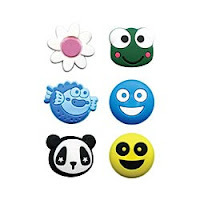 Check out these cute and colorful Gamma String Things! Dampeners decrease the amount of string vibration caused when you hit the ball. Choose one of these fun styles to better your play and brighten your racquet! 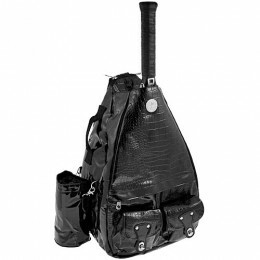 Great tennis gifts for any occasion. These come in packets of two for ONLY $2.50! We haven't seen Vera on the courts for some time, but we are all used to seeing her in athletic style. These pictures prove that Vera is not only a great athlete, but also a very beautiful woman and a great model. At seven years of age, Maria Kirilenko arrived at Moscow’s Dinamo tennis school with her father, a tennis aficionado and recreational player. In less than a year, she began to win competitions, and at the age of 12 she was “discovered” by Elena Brioukhovets – an Honored Master of sports who began to work with her. Kirilenko’s parents brought her daily to Dinamo and TsSKA sport grounds from Yubileyny – a small town in the Moscow region. In less than three years, she became # 1 in her age group. During this time, Maria received help from well-known tennis professionals Yevgeni Kafelnikov, Andrey Olkhovsky and Maxim Mirny – the creators of an organization to support young, up-and-coming players. 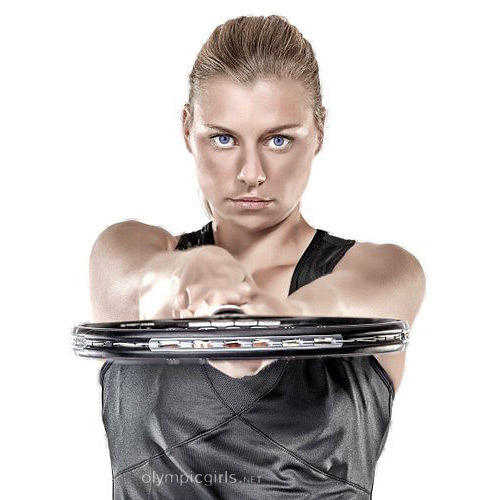 Maria Kirilenko’s hard work paid off - in 2002, she became one of the youngest winners of both the Canadian Open and US Open junior tournaments. In 2005, she won her first title on the WTA Tour, ousting Anna-Lena Grönefeld in the China Open. Kirilenko reached her career-high ranking of # 16 in May of 2012, and she currently stands at # 19 in the world. 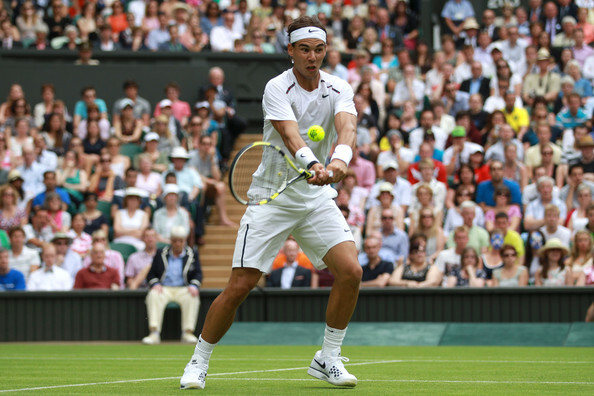 ← Who looks THIS good playing tennis? Maria was chosen in 2006 to be the face of Adidas Stella McCartney tennis line, but she was replaced by Caroline Wozniacki in 2009 - in our opinion…a big mistake!